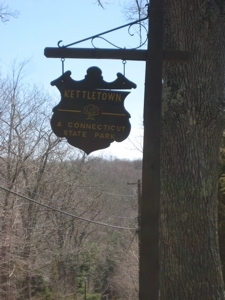 I had assumed that the Kettletown name was derived from the geologic features called kettles. As we all know, kettles are fluvioglacial landforms occurring as the result of blocks of ice calving from the front of a receding glacier and becoming buried partially to wholly by glacial outwash. Glacial outwash is generated when streams of meltwater flow away from the glacier and deposit sediment to form broad outwash plains called sandurs. When the ice blocks melt, kettle holes are left in the sandur. 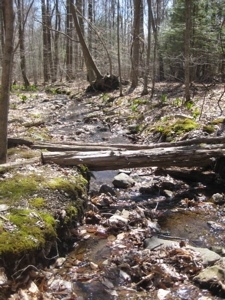 Kettletown State Park, situated in the towns of Southbury and Oxford, contains 605 acres and was originally inhabited by the Pootatucks, members of the Algonquin group. Early colonists reportedly traded one brass kettle for use of the land for hunting and fishing. Eventually, the settlers acquired complete rights to the area and, by 1758, the Pootatucks had either migrated to the northwest or perished. Although the Pootatucks were expert fisherman and hunters, their main occupation was farming. They raised fine crops of beans, squash, tobacco and apples. The Pootatucks developed a drum communications system which could carry a message over 200 miles in just two hours. All that remains now in the Kettletown area of this once prosperous tribe is an occasional arrowhead. 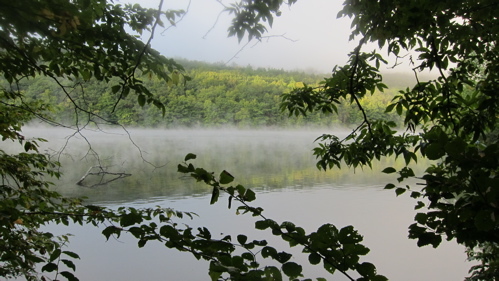 In 1919, their original village was covered by the water of the Housatonic River when the Connecticut Light and Power Company constructed the Stevenson Dam to produce hydroelectric power. The resulting Lake Zoar is the fifth largest freshwater body in the state. The settlers who had used the land for dairy farming had deserted much of it as better farming land became available elsewhere. 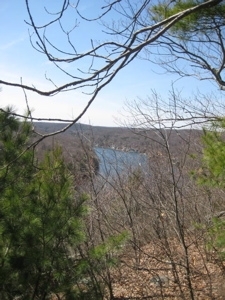 The State of Connecticut purchased 455 of the 605 acres in Kettletown in 1950 with funds left by Edward Carrington of New Haven, which he had dedicated to the acquisition of public land in the Naugatuck Valley. And there are several trails here for me to hike. 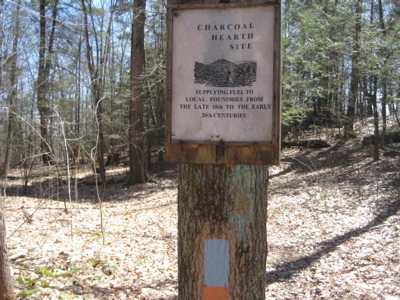 Organizing this stuff on CTMQ is proving difficult as the 4.6 mile Pomperaug Trail is half-contained within the park and the 0.6 mile Oxford Loop Trail is wholly outside the park, but both are still contained within the Kettletown Trails section of the CFPA Walk Book. 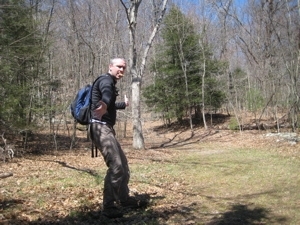 Yet the Pomperaug is a separate check-off on the CT Blue Trails Challenge list from the “Kettletown” trails. Frustrating. But only for me, I know. After completing the Zoar Trail across the Housatonic (Lake Zoar) River (CTMQ Hike Recap here), I decided the day was too nice to quit there. So I drove around to the other side of the river to knock out a short loop trail over in Kettletown State Park. I figured it would be good to get a good view of where I’d just hiked from the overlooks I’d seen a couple hours earlier. I liked the symmetry of that idea. Seriously, when hiking around Mount Washington, I’ve always found it cool that you can always see (on a clear day, that is) where you’re going and from whence you came. 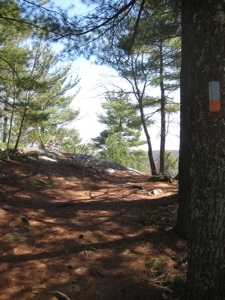 While not exactly the Presidentials, the same concept applies to these little trails. I parked and hopped to it. The short Miller Trail is a loop that begins and ends with a short climb/descent and follows old woods roads for the most part. It’s an easy walk and is used as a cross-country skiing trail which tells you it’s pretty flat and wide. A charcoal hearth site! Avid readers of my hiking pages know of my affinity for such things. 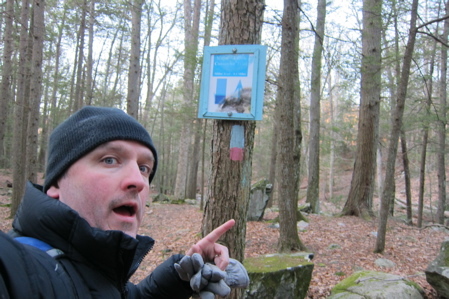 Major props to Kettletown for recognizing that the flat area in the middle of the woods deserves such signage! 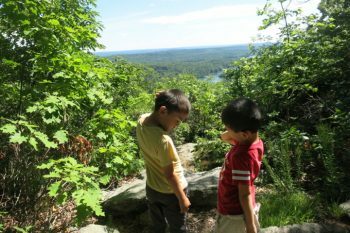 Not only was this spot worth noting for the hearth, but also because a scenic side trail starts here (blazed blue/orange) out towards the cliffs overlooking the Housatonic. 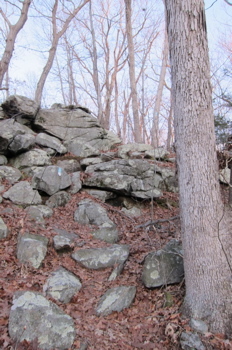 The side trail split near the top of the cliff, offering two different overlooks. Neither one is all that fantastic, but the one to the left (southeast) is better than the one to the right (west). 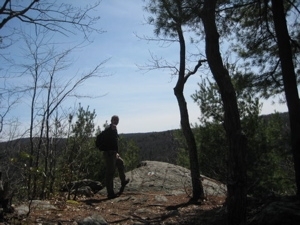 In fact, the little walk to the better one is the best 200 yards on the Miller Trail, as it wends its way through white pine along the cliff-top before ending at an outcropping. “You mean the charcoal burning hearth site?” Yes, that’s what she meant. “That was it! Right where that sign was,” I excitedly told her with her stupid dogs nipping at my crotch. She was unimpressed. “Huh? What did I miss?” I went on to tell her of the glorious history of making charcoal in the northeast but she interrupted me and pretended she just wanted to get out to the overlook. Sigh. At least she was out for a nice hike. 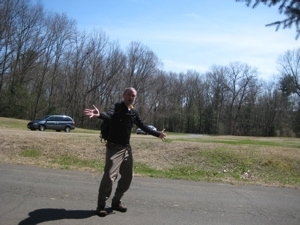 I bid her adieu and quickly made my way down the hill and back out to the lot where my car was. 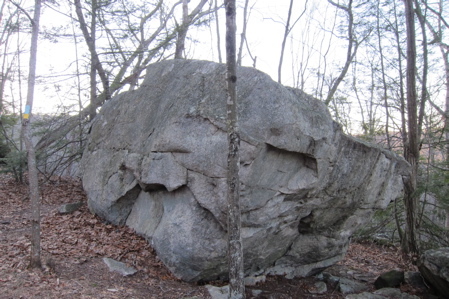 I noted the trail that connects to the Pomperaug Trail but had a healthy drive back across Connecticut in front of me and left it for another day. Remember how the winter of 2011-12 was the winter that never was? Our only snowstorm of any impact happened on Halloween. The winter was disturbingly mild to say the least. So why was it, that pretty much the only time I was able to get out for a good early morning hike, it happened to be the coldest day of the winter? 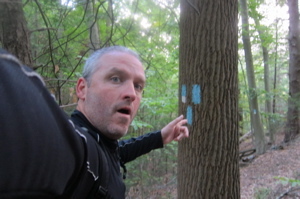 Of course, part of me was sort of excited about that part of the hike. When I left my house before sunrise, the temperature was in the single digits, but it also happened to be stupidly windy once the sun came up. 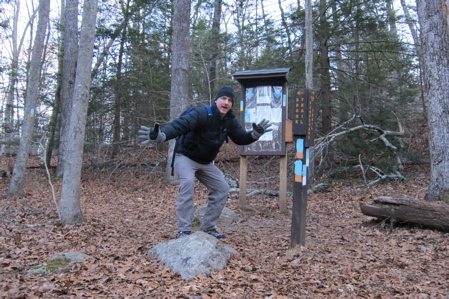 Cold hiking has never really bothered me, but I’m not getting any younger. Whatever, it was going to be sunny and clear and I was going to be hiking… So I’d be fine. 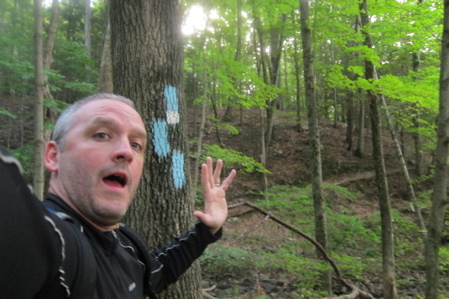 My 2012 hiking plan was to try to complete a lot of the trails I’ve partially done instead of starting new ones. The list is not lacking, trust me. Up first: The Kettletown State Park trails which are actually part of the Lake Zoar Area Trails according to the CFPA nomenclature. 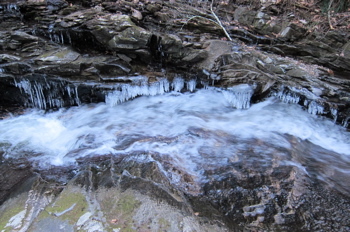 Let’s get bone-chilling cold hiking. I parked at the Jackson Cove recreation area in Oxford, right down on Lake Zoar (which is, of course, just a bulge in the Housatonic). I parked right beneath a security camera, which seemed sort of silly on a 5 degree January morning at 7 AM. On the other hand, I wondered if my appearance raised the hackles of whoever monitors such security cams. Like, who in the world is out and about at that time of day in such temperatures? Surely I was up to no good. 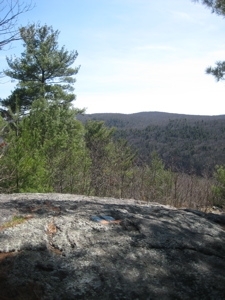 I hiked north on the Pomperaug Trail to reach the junction with the Crest Trail, which was built in 1980 by the Youth Conservation Corps. It parallels the Housatonic on the west and the much longer Pomperaug Trail just through the woods to the east. It’s certainly a more scenic link between the Kettletown park campgrounds and Jackson Cove than the much older (presumably) Pomperaug. It’s also a bit more challenging, but certainly not lung-searing. Although, when hiking in sub-zero wind chill, one’s lungs sometimes feel as though they are filled with ice instead of good clean air. The trail climbs a bit to attain the ridgeline above the river and then loops to and fro seeking out a few different viewpoints along the way. But even so, I was thoroughly enjoying myself. As I’ve often written, there’s something very peaceful and fulfilling to me about being alone in the woods enjoying things that relatively few people do – at least in central Connecticut. Sure, thousands have been to these viewpoints before and thousands will in the future. 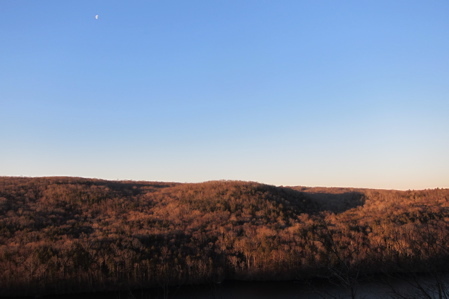 But I was there on the coldest, crispest day of the year watching the sun rise over the hills behind me with a nearly full moon in the sky above the Housatonic River below me. My picture here does the moment absolutely NO justice. The Crest Trail is a nice little hike that offers some nice views and a couple ups and downs. On to the next one. 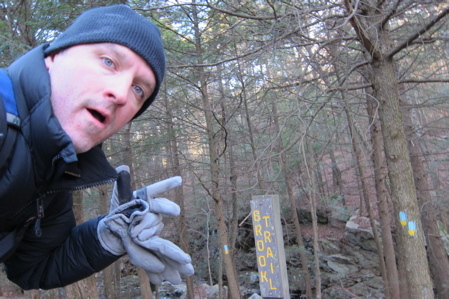 This trail is silly to write about. It’s just a straight shot down the hill to the campgrounds down by the river. Back in April of ’09, I walked about half of this across a couple park roads and then turned around telling myself that when I did these other, more southern trails I would pick up the other half of it. Flash forward 3 years and here I was… at the other end. 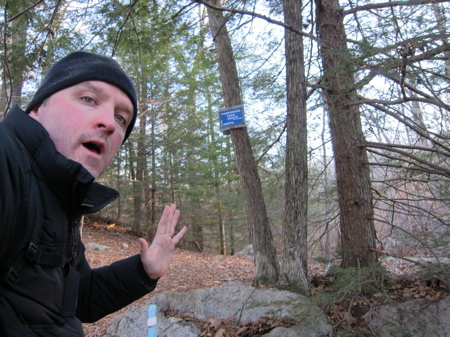 When you are a completist like me, you become sort of obsessive about “the rules” even though as hikers, most of us do believe in the “hike your own hike” ethic. It’s an internal battle I fight often. I mean, did I really have to hike a tenth or two of a mile to the road just to turn aruond and come back to the same spot on the Brook Trail (below)? Of course not… But I did it. Do you? Well, yeah if you want to connect the Miller Trail to a loop with these other trails (which is the point of the connector, of course). For a purely utilitarian trail, only blazed in 2005, the southern creekside part of it is kind of pretty. 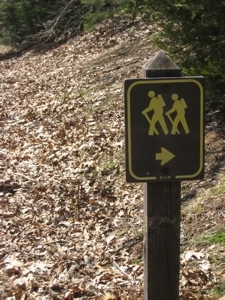 The Brook Trail is merely the continuation of the Crest Trail up to the main Kettletown entry area. It was just as cold as the previous trail, trust me. 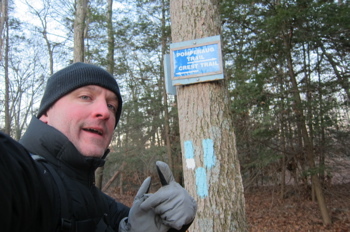 At the big trailhead intersection, there was a nice tribute to Alan Crepeau put up by the CFPA. Hey! I’m friends with the signers of that note! Such is the famous life I now lead after writing this site for 6 years. I’d crossed over from Oxford into Southbury. I care about such things.. For the record, it was just as cold in Southbury as it was in Oxford. It’s funny, these pictures don’t really show how cold it was because it just looks dry. I could convince you it was 50 degrees that day. My frozen wind-driven tears say otherwise. There are no overlook views on this little trail, but once I reached a park road and the trail took me down to Kettletown Brook, I hiked along what was probably the highlight of my morning. The “brook” is more of a creek in my book and it has carved out a beautiful little mini-canyon and cascades down giant boulders between moss-covered banks. Signs warning me not to swim were somewhat funny to me, as immediate death from hypothermia does not fit in with my future plans. The trail picks its way along the brook with a flat road mere feet away. Sure I could have hopped over to the road, but where’s the fun in doing that? 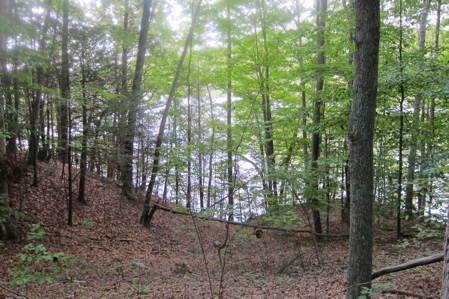 Ultimately, the Brook Trail ends when it joins the road as that is the junction with the Pomperaug Trail. It was there, while I was setting up my trail-ending photo, that a woman and her dogs appeared – startled beyond belief. She (and her large dogs) were freaked out that a man came bumbling out of the woods, so early in the morning on so frigid a day. Ah well, we exchanged waves and went in opposite directions: She to her warm car and me backtracking down the Pomperaug and back into the woods. Yeah, I know, this isn’t really in Kettletown State Park, but you’ll survive. 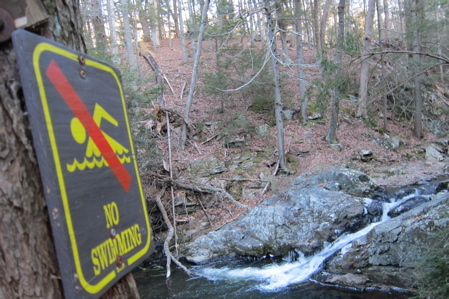 The trail itself isn’t a loop at all; rather, it merely parallels the Pomperaug (my hike of that one) and the Housatonic – giving hikers a better look at the river itself for a short while. A really short while. 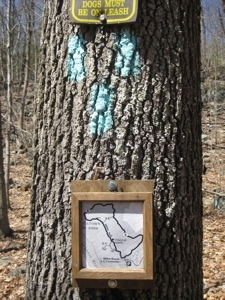 Since the last edition of the Walk Book was published, the southern end of this trail has been closed. 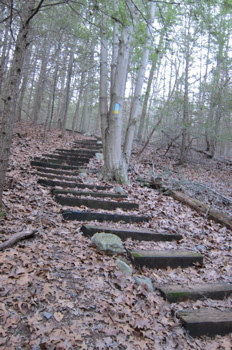 This has shortened the little trail by a good 2 or 3 tenths of a mile – AND it has eliminated a view/steep cliff hike. I imagine it was deemed too erosive or dangerous. And since drunken boaters probably come up here, it was best to close that little southern end. 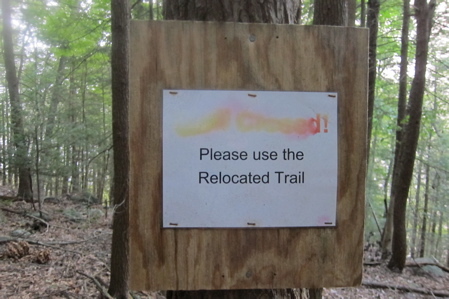 I was initially disappointed to come across the trail relocation sign, but once again have to give it up to the CFPA volunteers for staying on top of this stuff with signage and with hiding the old trail really well. The new southern terminus is right at the intersection with the Wells Brook crossing. Honesty time: The Oxford Loop is short, easy and doesn’t offer much – unless you’re looking for it. It does cross a pretty clearly defined old road bed at one point, that heads down to the river. This was another of those old roads that led to the town of Zoar, which was flooded back when they built the Stevenson Dam (creating Lake Zoar). I don’t know why, but these types of things always sort of freak me out. I know they’ve been doing city-flooding forever and have just done it to HUGE cities in China, but still… it’s weird to know what’s under the water now. 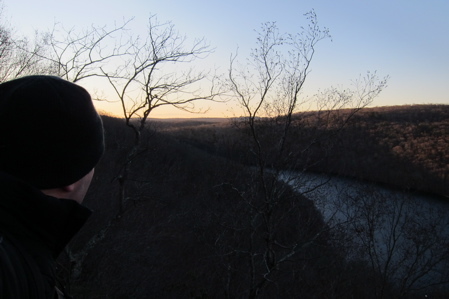 After that excitement, the trail heads up to Jackson Cove and gives the hiker a decent riverside view of the valley.